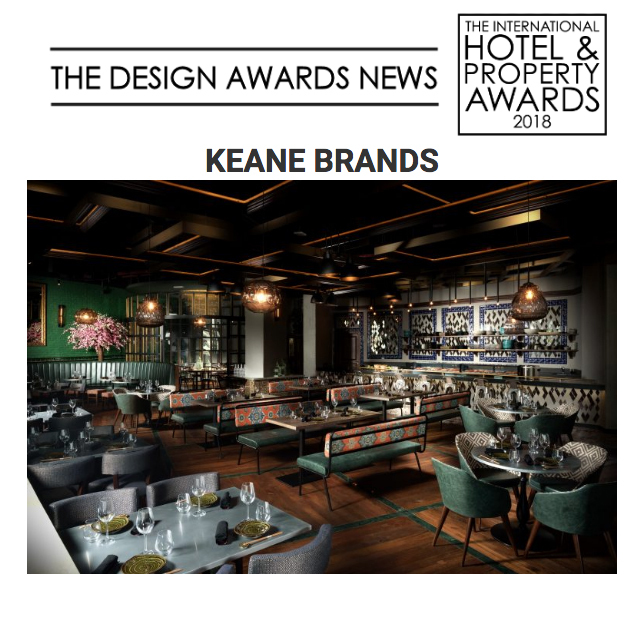 design et al are delighted to announce that Keane Brands have been shortlisted for Restaurant – Global Award in The International Hotel and Property Awards 2018. An intimate 1300SQM bar and restaurant operation that showcases Nikkei cuisine and hospitality. Celebrating the crossing of two cultures with reference to heritage and presenting them in a contemporary, relevant scheme. Capturing the mixed DNA of the centuries old Nikkei tradition and blending quintessentially Japanese and unmistakably Peruvian elements. Keane Brands set out to maintain old school glamour and rich cultural interior to reference both countries, whilst keeping a relaxed, inviting and approachable ambience. And to create a well zoned, but seamlessly blended transition between the bar, lounge, and dining spaces. Popular with most guests are the large, elaborate graffiti works commissioned to Ramy Elzaghawy. Other favourites include the subtler approach of the stencil lacquered Peruvian details on the grey concrete walls. Not something you see straight away, but with a sparkle of light, the shapes glisten off the walls and leaves guests with a little something to discover. By capturing the mixed DNA of the centuries old Nikkei tradition and blending quintessentially Japanese and unmistakably Peruvian elements, the interior offers a contemporary interpretation with a depth of distinction that is not on offer elsewhere within the vicinity. The space is zoned in such a way, that it caters for every occasion; be it group dining, romantic dinners, private lounging and drinking. You feel a sense of awe upon entering due to the large-scale mirrors, the wall murals, the Aztec print walls yet at the same time, there is a comfort factor that allows one to have a relaxed, rather than a stiff, dining experience. It is a destination for all of Dubai, and an exciting discover for anyone hungrily exploring Club Vista Mare. As AJI is located on the Club Vista Mare, a promenade of restaurants off the beach on the Palm Jumeirah, passing trade is in hot contest for all venders along the strip. From the outside, the approachability is immediately present, but the intrigue is to enter further. As you explore further, you can’t help but realise that you are discovering something far more glamorous, layered and delectable, without feeling intimidated. Each area offers a different experience, as varied as the menu and as heady as the cocktails.